On Tuesday, July 24th, 2018, the Firestorm team announced the release of Firestorm 5.1.7.55786. Coming somewhat later than had been hoped, it incorporates some significant updates from recent Lab viewer releases, together with updates from, and contributed to, the Firestorm team, plus the inevitable bag of bug fixes as well. Please use the table of contents on the right to jump to any specific topic of interest. Full details of all changes, and contributor credits can be found in the official release notes. There is no need to perform a clean install with this release if you do not wish to. Do, however, make sure you back-up all your settings safely so you can restore them after installing 5.1.7. Firestorm 5.1.7 has parity with all version of Linden Lab’s viewer, up to version 5.1.6, with additional cherry picked fixes from upstream of that release. KDU updated to version 7.10.4 (7.A.4) – Kakadu release notes. Firestorm 5.1.7 has been updated to Restrained Love API: RLV v3.2.1 / RLVa v2.2.0.55786 – see the RLVa 2.2 Release Notes for details. This is a summary of the main updates derived from Linden lab’s core viewer code. 64-bit Project Alex Ivy: rebuilds the viewer using 64-bit address space, utilising Linden Lab’s Alex Ivy code base. This should improve viewer stability, particularly for those with more than 4 Gb of memory, and possibly also improve performance. As the 64-bit Alex Ivy code uses Linden Lab’s Havoc sub-libraries that are specific to Second Life, this means that the 64-bit versions of Firestorm for Windows and OSX now have both Second Life and OpenSim flavours, the latter allowing for continued support of OpenSim users. The 64-bit Linux build remains with the Firestorm team’s own 64-bit code. Media Updates – Project Dullahan: a series of updates, fixes, improvements and security patches for the Chromium Embedded Framework (CEF), that is the basis for the viewer’s built-in web browser. The option to not accept cookies has been removed due to complexities of not doing so in the in-viewer browser. For a more controlled cookie experience, an external full-featured browser may be better. Also includes updates to VLC, that provides support for video media playback. Rendering Improvements – Project love Me Render: this is a large collection of rendering improvement from LL. See the Love Me Render release notes for details. Adds support for a higher quality voice using SLVoice version 4.9. Fixes the apparent position of the speaker in nearby voice. Improves retry behaviour when there are problems connecting or during temporary connection problems. Logs more detailed information to the Lab for quantifying connection issues. Improves security of the communication between the viewer and SLVoice. With some SLVoice changes, the SLVoice executable can be copied into another viewer – that will not work with this update. There are changes to the connection between the viewer and SLVoice that are required. Talking to any viewer version should work. Unrelated to voice, improves the validation of TLS certificates (security improvement). Sculpties no longer rendered until fully loaded (or fail to load): this should remove the blobs and spheres see in-world as sculpties load. Viewer frame rate fix (BUG-6943): viewer FPS should no longer drop when facing away from certain objects. Inventory directory (BUG-214575 / FIRE-22281): the inventory directory should no longer be deleted while keeping the Delete key. Report Abuse (BUG-202904 / FIRE-22152): double-clicking the Report Abuse option will no longer crash the viewer. Materials update: normal and specular maps are no longer downloaded if ALM is off. See the Firestorm Change Log for a full list of Lab and Firestorm fixes. A new Favorite Wearables option for accessing the Favorite Wearables panel (see below). A new Show / Hide User Interface option (also ALT-Shift-U). Use the keyboard shortcut to show the UI when hidden, and note that chiclets and script dialogues remain visible with the UI hidden. CTRL+ALT+F1 will still hide / show the UI as well. Set Home To Here relocated to be with the other place-related options. Teleport Here has an added separator between it and the menu options below it. 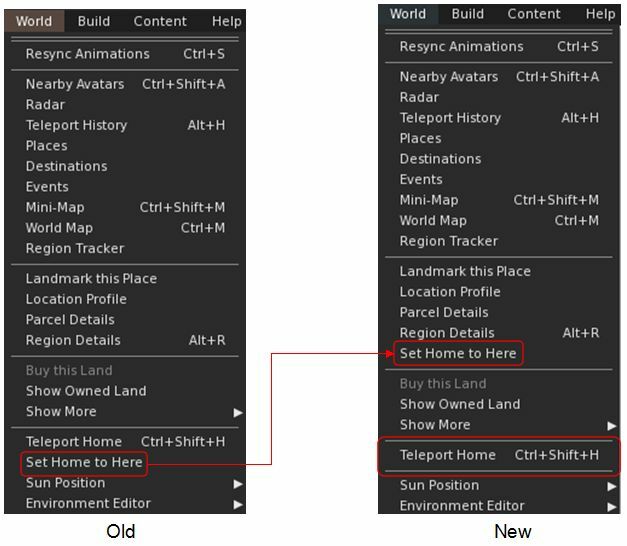 World menu: Set Home to Here has been relocated, and Teleport Home has an additional separator below it to help avoid incorrect clicks when using it. Help: new item: Firestorm Events Calendar – opens the Firestorm Google Calendar of event, including all Firestorm classes. Uploads: new button to reset custom uploads folders to their viewer defaults. 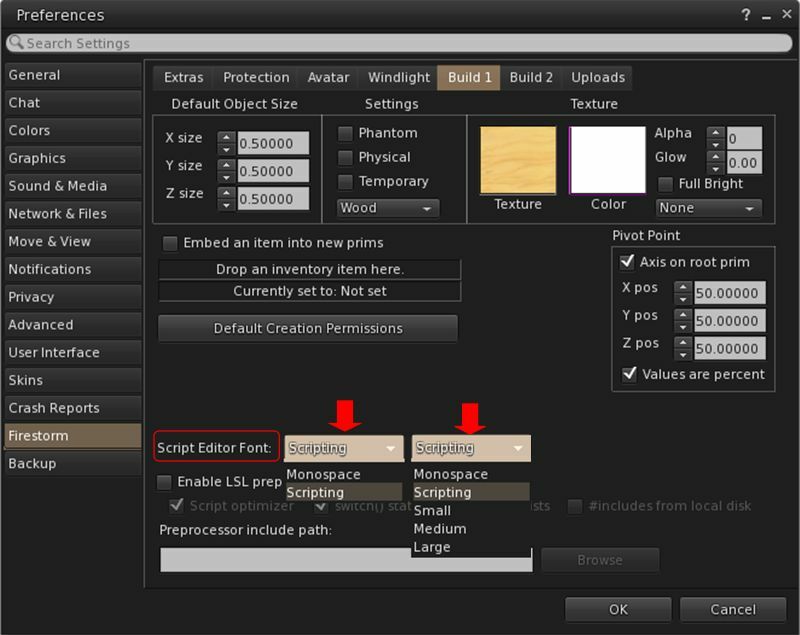 Build 1: it is now possible to switch the Script Editor font type and adjust the font size. All pre-processed output also obeys the chosen font. 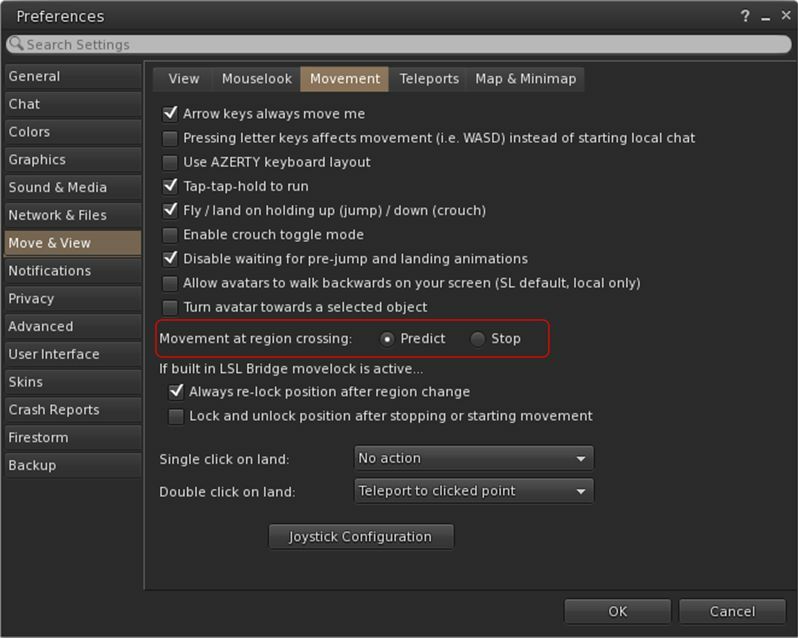 Move & View: new options to manage viewer-side region crossings add to the Movement sub-tab. See Experimental Region Crossing Code, below. 2D Overlay: new option to make the statistics bar ignore focus requests when closing other floaters with CTRL+W. When enabled, the statistics bar will never receive focus when another window is closed. Actions such as changing graph layout for items are still possible when enabled. Beacons: opening the Beacons floater panel. Wearable Favorites: see Favorite Wearables Panel, below. Wearing Tab: the Wearing tab now lists the rendering complexity of each worn in-world object. This can be accessed via the Avatar menu > Appearance (or CTRL-O) and then open the Wearing tab. Wearing tab – double-click will remove for “Wearables” and “Temporary attachments”. A new “Options” button has been added to the Inspect panel allowing you to select which columns are displayed. New object complexity count added to the information display on the left of the panel. The Favorite Wearables panel can be used to list frequently used items (e.g. HUDs, attachments) in a floater so they can be quickly attached or removed as needed. This can help with performance, as you can conveniently detach attachments you’re not using and remove their simulator script overhead, or take off HUDs you’re not using, to remove their texture memory use, then quickly re-attach them when needed without having to locate them in Inventory. The panel has its own toolbar button for quick access., or can be opened via the Avatar menu > Favorite Wearables. Open the panel and your inventory. Drag the items you want to display in the panel from inventory into the panel window. Note this will create a link to the original item in the #Wearable Favorites folder in inventory. To remove an item from the panel, right-click on the item to highlight it and then click the Trash icon at the top of the panel. This will remove the item from the panel’s list, delete the link in the #Wearable Favorites, but will not delete the item from your inventory. To attach an item listed in the panel, simply right-click on it to display a menu comprising the familiar Add, Wear, Attach to and Attach to HUD (for HUDs) options. This menu also allows you to view the object’s profile, or use Show Original to open your Inventory and highlight the original version. 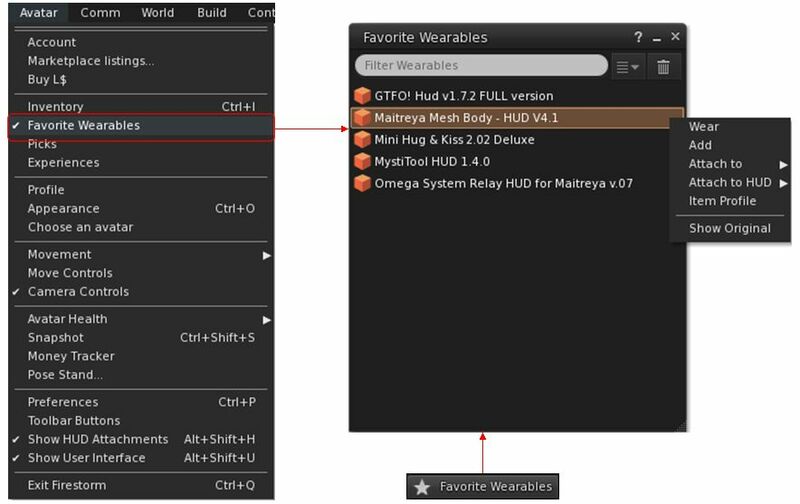 The Favorite Wearables panel can be accessed via the Avatar menu or a new Toolbar button. It can be used to list HUDs and other frequently used attachments which can be added / removed via a menu. Right-clicking on an attached item (shown in a different colour in the panel) will display a menu with options to edit the attachment (opens the Build panel), detach it, open its profile or locate the original in inventory. In addition, the panel includes a search bar that will cause the panel to only display items which fully or partially match the text typed into it, and a drop-down list of sort options. Firestorm 5.1.7. 55786 adds the ability to ban avatars from a parcel for a specified amount of time between 1 and 8,766 hours (approximately 1 year), with 0 being “forever”. Access About Land via the location bar at the top of the viewer or via World > Parcel Details. Click on Add from below the Ban list (below, left) to open the Resident picker. Enter all or part of the name of the avatar to be banned. Select the required name from the displayed list and click Select (below right). The ban time panel will open (seen bottom right). Enter a value between 1 and 8766. Click OK. The individual will be added to the parcel ban list, with the total number of minutes of their ban remaining. As I’ve reported in several of my SL products updates, Joe Magarac (animats) has spent several months investigating viewer-side region crossing issues – notably the “half unsit” issue that can result in a loss of the vehicle (see BUG-214653 / FIRE-21915). In sort, when making a region crossing, the current simulator must effectively “detach” all avatars from a vehicle and package them and all their attachments (including the sate of all scripts they are running) ready to hand over to the next region. The same has to be done with the vehicle as well. The receiving simulator then must unpack all of this information and put vehicle and avatars all back together in the same state as they were in the previous region, and moving in a manner the user(s) would expect. By default, while all this is going on, the viewer continues to render vehicle and occupants as if they are still moving, but the user has no control over the vehicle. Then when the receiving simulator has unpacked everything and put it back together, it sends any update to the viewer on where the vehicle actually is, which can result in the vehicle appearing to “rubber band”, etc. All of this requires a lot of simulator / simulator and simulator(s) / viewer communications – which can go wrong / get out of sequence and so on, resulting in issues (and even vehicle “loss” / return, with the avatars dumped on the ground / under the sea. Predict: pretty much the “default” behaviour seen in all viewers, and described above. Stop: this causes all motion of the vehicle and its passengers as seen in the viewer to stop as the region boundary is reached. Motion then resumes after the simulators have completed the hand-off one to the other, and the viewer has received the expected update from the receiving simulator. Stop is designed to prevent issues of mus-communication and the potential full / partial unseating of avatars from a vehicle, and the possible loss / return of the vehicle to inventory. Predict leaves the vehicle moving without user control and subject to weird motion / avatar unseating /. vehicle return. Stop generally prevents all of the above, but can break the illusion of travelling by bringing the vehicle to a complete stop at every region crossing, before resuming. As such, which is preferred comes down to a matter of personal preference. The video below demonstrates both options in use. A to the wiki voice troubleshooting page has been added to the “trouble connecting to voice server” notification window. New chat feedback add to CTRL-R Always Run: “Always Run enabled/disabled”. Show Growl notification when receiving TP offers/requests. Threaded filepickers added to: Group member list export; Avatar shape import; Appearance to XML; Region terrain upload & download; Beam editor. Linux filepickers now remember most recently used directory. Radar Menu – avatar render options: the right-click avatar context menu in the radar panel now includes the option to Render Normally (default), Do Not Render, Render Fully. Jean Severine – Gothic skies: Jean’s Gothic Moon 01; Jean’s Gothic Moon 02; Jean’s Gothic Wasteland; Jean’s Gothic Winter. Penny Patton – Windlight skies: 80’s Wave, Glowing Sea, Synthwave, The Shed; Windlight Day cycles: Anime Daze, FALLOUT SL 1.0, Hyborian Coast. Lassie Resident – Lassies Clearwater, Windlight water setting. A wide range of fixes and updates, as noted above, including OpenSim fixes – see the release notes and the change log for details. A complex update with a multitude of fixes and a lot of new features for people to try. I’ve been driving the Firestorm 5.1.5, 5.1.6 and 5.1.7 pre-releases and beta versions for the last several months, and 5.1.7.55786 has proven the most stable and reliable. In addition, and where my own computer is concerned, it has afforded another slight boost in average FPS, plus it and a recent update to my video capture software means I’m having a lot more success with video recording with Firestorm than has previously been the case. In practical terms, the time-based parcel ban is liable to be popular with many, as (I would hope) the Favorite Wearables (even if I have kept wanting to spell “favorite” the UK English way!). I’ve been using this for my set of preferred HUDs, which I don’t require the whole time, and like it a lot. I suspect the Predict / Stop options for region crossings are liable to be the subject of much debate. However, the important thing to remember is that if you fly / drive / boat / sail, you can use whichever option best suits you. One thing I have noted from my own perspective, is that the pauses associated with Stop tend to last a second or so longer than the loss of control experienced with Predict. Of course, YMMV. Previous Post 2018 SL UG updates #30/1: the Lindens are away! Thanks for the ‘break down’…makes things clearer for me. Hi There.. My I know how to update to latest version? Go to https://www.firestormviewer.org/, click Downloads from the top menu, select the correct version for your operating system from the options & following the Install Instructions linked to on the download page. Predict: the “default” behaviour seen in all viewers, and described above. At first this seems to be the same behavior as the old “Velocity Interpolate Objects” option, in the Developer Menu / Networks. If you turn off and on this option, you can see it in the previous viewers and how it stops during sim crossings. It had advantages, but it ruined the immersion a little. John Nagle however worked on workarounds. https://jira.phoenixviewer.com/browse/FIRE-21915 Interesting discussion. This is actually John’s work – he’s Animats, as mentioned in the article 🙂 . Very happy with update, but… Is there something wrong with avatar Move & View|Movement|View Angle? It seems that View Angle and Distance are the same now. When I walk through a house, I am in the roof. I keep wanting to change the camera angle, but of course that has nothing to do with the ‘viewing’ angle and nothing in Movement fixes it. Hope this makes sense, I never mess with these settings normally. Some preferences have been made non-persistent, as per the release notes. The best place to ask for direct assistance is via the in-world Firestorm support gtoups, such as Firestorm Support English, where you can get real-time help, either in chat or via IM from a member of the support team. Sorry, I thought I was still on the FS page. It was late. 🙂 After I realized that and went back to FS, I did search/look for it in the full release notes and knowledgebase, but didn’t find anything. Will try again under ‘persistent’ and/or do chat. Thanks, hope there is a solution for I love this release otherwise, esp Favorite Wearables! No worries 🙂 . You’re just more likely to get direct & immediate help through the support groups rather then by blog post comment exchanges 🙂 . It is only me or with this last version we get “Unable to save snapshot” error message trying to save a snapshot to disk? I’ve not encountered that myself, and have been using the snapshot floater throughout all testing of version up to and including 5.1.7 (although I personally don’t use the Quick Snapshot button). If the problem persists for you, suggest you ask via the in-world support groups, such as Firestorm Support English, where you can get real-time help, either in chat or via IM from a member of the support team. Thanks a lot for this Inara, your page is always the best and most thoughtful review of changes in a Firestorm release. I hope it’s ok, Ive linked my group managers to your page but Ive also copied to an NC and sent them the step by step for the timed land ban. Your idea of using Fave Wearables to store all those HUDs we tend to keep on all the time ‘just in case!’ is genius. I’ve also lived with this release and it’s predecessors a while, it’s been rock solid for me. I’d advise folk to make the move, unless your current viewer does all that you need already. Thank you – and no problem in sharing 🙂 . I cannot take credit for using Favorite Wearables for HUDs – that was pretty much one of the core ideas 🙂 . But if you do tend to use a lot of HUDs, it really can ease things. As a flyer / sailor / boater, I’ve finally got around to moving the vehicle-related HUDs I commonly us to the panel for ease of attachment / detachment 🙂 . J’ai installer la mise a jour 5-1-7 mais je ne peu plus mettre firestorm en français, avec ma version précédente il y avait un extension pour le mettre en français mais elle ne fonctionne pas avec la mise a jour. Es-ce que quelqu’un sais pourquoi ? Je pense que le meilleur endroit à demander est dans le monde dans le francophone Firestorm Support. Thank you! Unlikely to be any environmental handling updates, as we’re (hopefully!) not far off the Lab’s Environment Enhancement Project appearing, which in itself will cause some changes. Fantastic notes as always, Inara. Thank you very much! TY! And thanks to you and the team for all your hard work in bringing us the viewer. well i think Stop is not effective ,neither stop or predict the un sitting of the avatar is more so now with new release 517 firestorm . almost even before even getting in a vehicle of any type no matter what the size of the avatar . i would be willing to show u what i’m talking about but i’m sure your aware of it .Every time I cross or I sit ao on off not matter my Avatar cowers under what ever i’m sitting on .in fact i almost prefer predict to stop my avatar bounces back up in the seat some time . Chris Charon made a workable add on it works . Now why did not some one else discover this issue i’m not the only one experiencing this issue .The New Feature Stop is longer transition also at least the old way i’m trained to were my vehicle will your words rubber band to .You all do a wonder full job for us at second life this is the first viewer i have to say i have a serious problem with its huge ! I’m not a coder i like beta testing i hate apple but i use the fruit a fruit phone because its free and i beta test it for work and I use windows 10 on my pc which I love but linux was my old favorite .Ios 12 is a joke windows 10 beats it .Firestorm beats Singularity lets keep it that way dependable this release seems very beta in it’s habit’s to me .i’m not a computer geek just one that likes to bang keys and push limits . It really is a matter of personal preference as to which you prefer – hence why you can toggle between the two modes and just keep the one you prefer selected 🙂 . Also, remember, this is experimental and potentially dependent on the Lab making much deeper changes to the region crossing code and communications on the server side of the equation (this is purely a viewer-side change, so even people in the same vehicle can experience region crossings differently, depending on whether or not they are using Firestorm and which of the two options they have selected. I understand what you mean by “cowering under”. As a Firestorm user, I simply use the Resync Animations button to correct it when it happens in my view. That tends to work in the majority of cases where I (and my passengers) end up sitting “in” or “under” their seats in a vehicle. Again, this is only a viewer-side adjustment (so passengers on other viewers won’t see any correction), but as we’re all primarily concerned with what we are seeing in our own view of the world, it’s a quick way of righting things in lieu of other options. Am glad to have read this. I’ve been coming back to SL more often than not and it’s pretty amazing on all of the upgrades and changes I’ve been seeing. Good informative stuff to read. Ty! Thank you! And you’re most welcome! has anyone else experienced going to an event, then coming home and all attachments being removed? this is happening to two of my “landmates” everytime they go anywhere, or change cloths, or tp to an event, all attachments including cloths, huds, nails, jewelry, body, are missing. Will the new update help with this? Loss of attachments on region crossings (and teleporting is a form of region crossing) was a significant issues some time ago, and the latest version of Firestorm should include the various fixes from the Lab to help combat this. Things aren’t perfect with TPs, so glitches may still occur, but on the whole the experience should be better. If you continue to have problems that can be reproduced, please consider raising a bug report via the Firestorm website, giving clear step-by-step notes on what happens, and under what circumstances – include things like region names, details of attachments removed, etc.